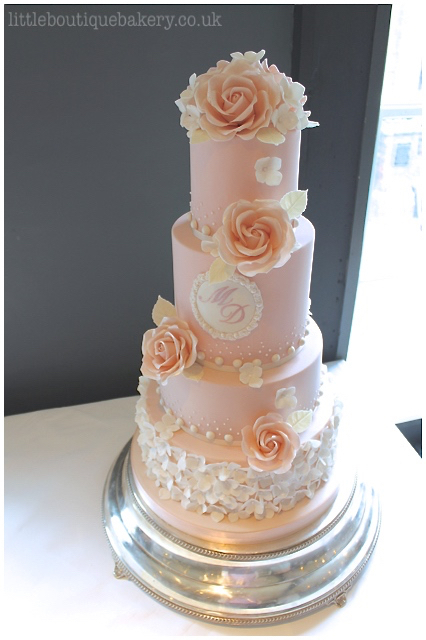 Our wedding cakes are expertly designed bespoke cakes made here in Tunbridge Wells on the East Sussex border. Your wedding cake is one of the main focal points of your day and probably one of the most important and significant cakes you will ever have. There is nothing we like more than meeting with our couples and poring over their ideas for their special day. We take all of these elements and your preferences to design something unique and beautiful for you, with a truly personal service, each cake is tailored to your special occasion. Our cakes are made from scratch using the best ingredients like pure butter, fine grade flour, free range eggs, organic fruit – no oils or pre made cake here! Your wedding cake is meticulously crafted the week of your wedding down to the last detail and carefully placed sugar flower and finally hand delivered to your wedding venue for set up. The wedding cake here was designed for a wedding taking place at the lovely venue of The George in Rye in East Sussex, where we are a recommended supplier. Our bride was looking for something very pretty and feminine in design. 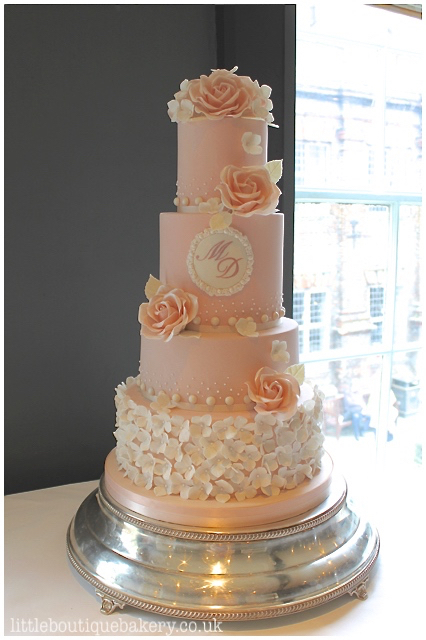 This large four tiered wedding cake was created with a soft blush pink icing with large hand crafted sugar roses and hydrangea petals to echo the bridal flowers and lovely sugar pearl detail with a personal hand painted monogram plaque. They chose a madagascan vanilla cake layered with a vanilla bean buttercream and seedless raspberry preserve for their guests to enjoy.